Shoulder Girdle or pectoral girdle is the bony ring, incomplete behind, which serves for the attachment and support of the upper limbs. 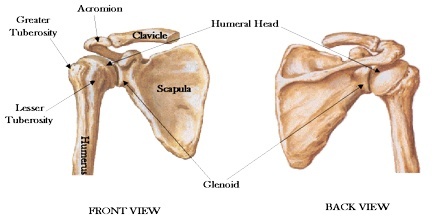 It is formed by the manubrium sterni, the clavicles, and the scapulae. In humans it consists of the clavicle and scapula; in those species with three bones in the shoulder, it consists of the clavicle, scapula, and coracoid. Some mammalian species (such as the dog and the horse) have only the scapula. 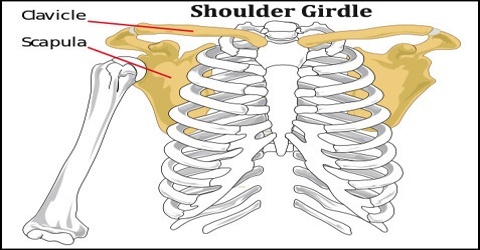 Shoulder Girdle or pectoral girdle connects the upper limb to the axial skeleton on the left and right side of the body. There is an anatomical connection between the pectoral girdle and the axial skeleton; that is, the sternoclavicular joints anteriorly. There is a physiological joint – (scapulothoracic joint) or muscular connection between the shoulder girdle and the axial skeleton, which is formed by muscles including the trapezius, rhomboids and serratus anterior. This scapulothoracic joint is highly mobile and allows great movements of the shoulder girdle. The shoulder joint is not held in place with bones, but rather an elaborate system of muscles, tendons and ligaments. Those most at risk for shoulder problems are athletes or workers with “overhead” movements—swimmers, throwers, painters and construction workers. From its neutral position, the shoulder girdle can be rotated about an imaginary vertical axis at the medial end of the clavicle. Throughout this movement the scapula is rotated around the chest wall so that it moves 15 centimetres (5.9 in) laterally and the glenoid cavity is rotated 40–45° in the horizontal plane. The scapula can be elevated and depressed from the neutral position to a total range of 10 to 12 centimetres (3.9 to 4.7 in); at its most elevated position the scapula is always tilted so that the glenoid cavity is facing superiorly. There are three joints in the shoulder girdle. One joint is where the head of the humerus articulates inside the glenoid cavity of the scapula, called the glenohumeral joint which includes the ligaments, tendons and muscles attached to these two bones. 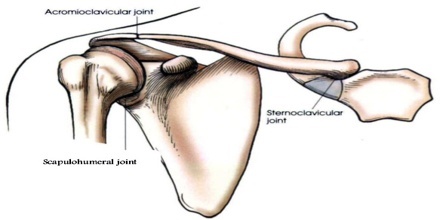 The acromioclavicular joint (A/C Joint) includes the ligaments, tendons, and bones where the acromion (on the shoulder blade) joins at the clavicle (collar bone). The third joint is the sternoclavicular joint which forms where the sternum (breastbone) joins the clavicle (collar bone). Humerus (upper arm). The humerus is the ball part of the ball-and-socket joint. The head (ball) of the humerus articulates within the glenoid fossa. Below the humeral head is the anatomic neck which separates the head (ball) from the tuberosities. Reference: thefreedictionary.com, kenhub.com, healthpages.org, wikipedia.